(This section is due to be extensively revised and enlarged. My favourite Deep Space missions were the Voyager project, which will journey on forever. A peak of my spacetracking career was Voyager 1s arrival at the planet Saturn when I was hands on the receivers at Honeysuckle. Only once every 176 years do the giant outer planets line up to allow a spacecraft to visit Jupiter, Saturn, Uranus, and Neptune with a minimum use of fuel and time. Using the gravity assist technique, or slingshot effect, the flight time to Neptune was reduced from 30 years to only 12. So a Grand Tour mission was planned, but only costing $US865 million to Neptune, half as much as the Viking project. Using Titan-Centaur rockets Voyager 2 was launched first, on 20 August 1977; then Voyager 1 was launched on a faster, shorter trajectory on 5 September 1977. 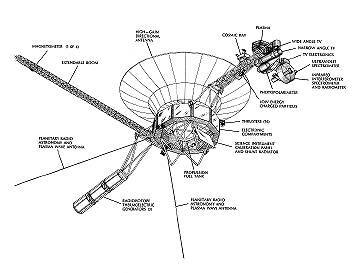 The Voyager spacecraft. Cameras and sensors on the right and the thermoelectric power supply on the left. The long magnetometer boom is not shown. 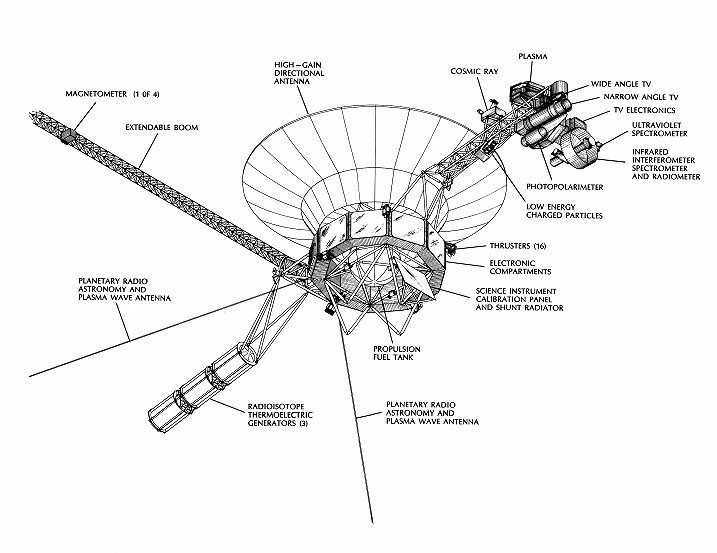 A diagram of the main components of the Voyager spacecraft. The Voyager spacecraft is a marvel in any context. It is a showcase for mid 1970s technology. It can point its scientific sensors to an accuracy of 0.1 of a degree. As it shoots past a planet or moon, tiny Hydrazine rocket motors with a thrust of only 85 grams can hold the spacecraft 60 times steadier than the hour hand of an analog clock. The telephoto television cameras are powerful enough to resolve a newspaper headline from 1 km away. There were 60 scientists and engineers at JPL, known as the Spacecraft Team, looking after the spacecraft, at any given moment half would be busy with planning the mission, while the other half were engaged in analysing the data being sent from the spacecraft. Each spacecraft has 65,000 individual parts, one computer memory alone contains over a million electronic parts, but by todays standards its total memory capacity was only a mere 514 kilobits, which would hardly rate a calculator these days. Expecting radiation doses over one thousand times the lethal level for humans, these sensitive components were radiation hardened and shielded from the harsh space environment. In the navigation department, the toughest target was Neptune, where the target accuracy at the planet of 100 kilometres, divided by the trip distance (arc travelled to the planet from Earth) of 7,128,603,456 kilometres is equivalent to sinking a 3,630 kilometre long golf putt! Their fuel efficiency on arrival at Neptune was 13,000 kilometres per litre. This efficiency will continue to improve until the fuel runs out. The rings around Uranus were so dark, it was comparable to photographing charcoal at a distance of 3 metres illuminated only a one watt bulb using 64 ASA film. Sending data back to Earth was a technical marvel. Images begin to smear if the spacecraft is travelling more than 100,000 kph (62,139 statute miles per hour), so the spacecraft has to turn to keep the subject firmly locked in the camera lens. Then the data rates drop dramatically as the spacecraft moves further out. At Jupiter, for instance, the telemetry data rates were a high 115.2 kilobits per second. By Saturn they were down to 44.8 kps, so it took a lot longer to transmit the same amount of data. Voyager 1 made its closest approach to Jupiter on 5 March 1979 at a distance of 206,700 kilometres above the cloud tops, followed by Voyager 2 on 9 July 1979 at 570,000 kilometres. Saturn is named after the Roman God Saturnus of sowing, or the seed, and father of Jupiter. He spawned a happy Roman festival called Saturnalia, held in December and connected with the winter sowing season. All work and business was suspended for up to a week, slaves were given temporary freedom to say and do as they liked, and moral restrictions were slackened off. Do you see Saturn as a happy, party planet? No, because Saturn is the also the God of Time and Fate, and the Medieval astrologers only saw malign influences in Saturn, delivering nothing good to those whose lives were subjected to him. 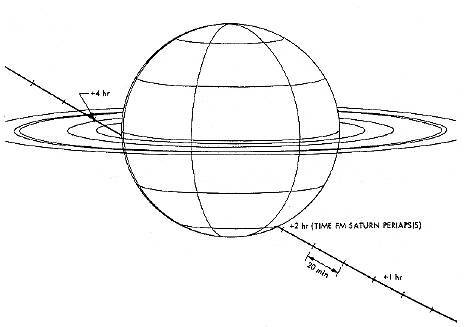 As it is visible to the naked eye, Saturn was known as a planet to the ancients. 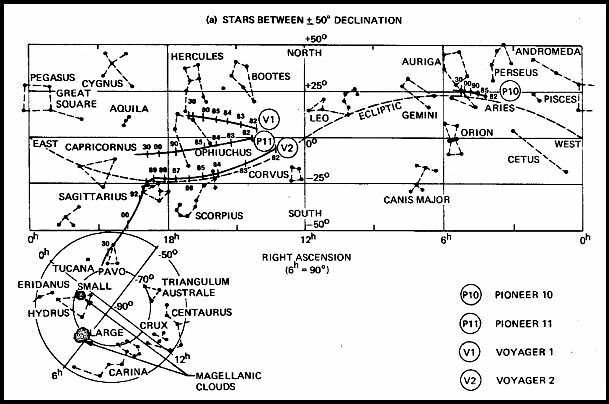 The first people to record their observations of the heavens, such as the nomadic tribes of ancient Egypt, noticed that the planets behaved differently to the other stars, so they were called planets, or wanderers. The Babylonians noticed Saturn moved more slowly over the fixed stars than the other planets so it was always regarded as the most remote planet until the discovery of Uranus in 1781. 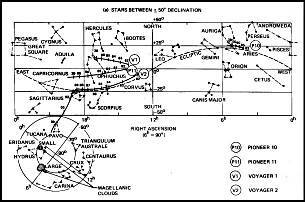 The first book on astronomy, Almagest, written by Ptolemy about AD130 showed Saturn as the farthest planet revolving around the Earth. Of course, now we know it takes Saturn about 30 Earth years to orbit around the sun, so it has only been around twice during my whole lifetime. With his original crude telescope in 1610 Galilaeo spotted an odd shape to Saturn, which changed with time, but nobody could figure out what these handles were until Christiaan Huygens proposed that Saturn had rings in 1659. As Voyager 1 homed in on Saturn, nearly two years after its encounter with Jupiter, excitement rose to fever pitch around the corridors and science labs at the Jet Propulsion Laboratory at Pasadena. At Honeysuckle and Tidbinbilla we began to concentrate on the encounter procedures. From our point of view it was the same as any other track except for the signal dropping out when the spacecraft went behind the planet. In these deep space missions we could not see what was going on in real time, as we could not see any pictures. We had to wait for them to come out in the popular media such as Time Magazine, like anybody else. In contrast to fiery, massive Jupiter with its violent storm-tossed atmosphere, volcanic pizza-like moon Io, and gigantic lightning bolts, Saturn looked cool and ethereal as Voyager approached it on November 10, 1980. A JPL scientist said, After Jupiter we were afraid Voyagers Saturn encounter was going to be a bust. But to their surprise many more reporters arrived at JPL for the Saturn encounter than the Jupiter event. Voyagers encounter with Saturn probably created more interest than the Jupiter fly-by because the stunning results from the first encounter whetted the appetites of the media, there were the unique rings to look and marvel at, and the moon Titan with its atmosphere and nitrogen seas roused the medias interest, hoping for a possible breakthrough story about a new world. Larger than the planet Mercury, Titan has a nitrogen atmosphere similar to the Earth, but with perpetual clouds which scientists think could drop fine methane sleet into liquid oceans of methane. Titan is so far away from the Sun, full daylight on Titan is probably the same brightness as moonlight on earth. To Earthly humans, it would seem a bizarre world indeed. It is interesting to speculate on the experiences of Earthlings when they land on the surface of Titan one day and stand on a frozen coast to look out at a sea of methane ruffled by nitrogen breezes under a dull, glowing red sky. As the mission progressed, the planners wrestled with many possibilities and doubts as they aimed the spacecraft at the ringed planet. Originally there were 10,000 possible paths past Saturn for Voyager 1 to fly down. A team of ten scientists responsible for the mission navigation had to boil it down to just one - one that had to be right. The moon Titan was a prime target, but if the spacecraft flew by Titan it couldnt continue on to Uranus and Neptune, so Voyager 2 was planned to follow the second route to continue on to Uranus and Neptune. If Voyager 1 failed to cover Titan, then Voyager 2 would have to be redirected to cover it, and miss out on the outer planets. So Voyager 1 had to be successful, which it was. Voyager 2 could then follow a trajectory to take it on to Uranus and Neptune. How close to the rings can you go without damaging the spacecraft? What would happen if there was something there? Of course we werent involved in all these politics at Honeysuckle, we were busy following Revision D of the 618-700 NOP, or Network Operations Plan for Voyager. I was working on the receivers on day shift when Voyager 1 had its encounter with Saturn. 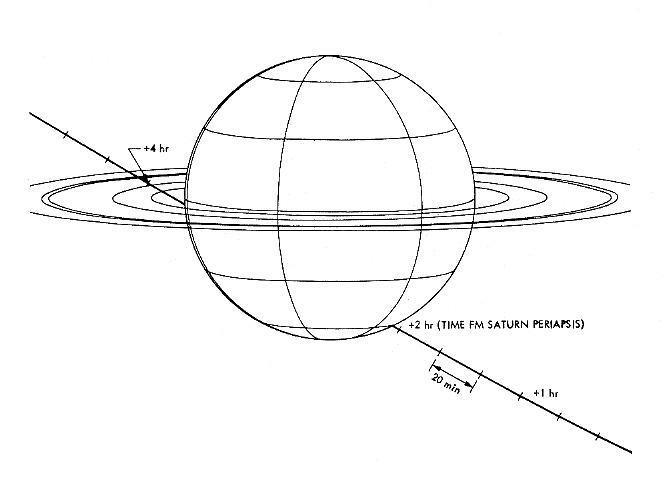 Fig 1-6 of the Network Operations Plan (NOP) 618-700, Revision D for Voyager showing the path of the Voyager 1 spacecraft past Saturn on November 13 1980 as seen from us on the Earth. On the Honeysuckle receivers I had to use this diagram to visualise what was actually happening to the spacecraft and our signal. For years we had been tracking the Pioneers and Voyagers, nursing them through the Jupiter encounters, and suddenly here was Voyager 1 about to approach the ringed planet. In the USB area there were four of us - Tony Gerada, the Shift Supervisor, myself the Servo operator, Terry Hearn, the Receiver and RF operator, and a Data operator. It was the afternoon of our day shift on November 13, 1980 (still the 12th in the USA). We had had our 50 cent cooked lunch in the canteen. Earlier in the day I had already been up the antenna and jotted down the transmitter meter readings after checking the servos were running sweetly. It was always a nightmare that something would fail and immobilise the antenna just when the Americans were depending on us. Back in the USB room I loaded the predicts (instructions to point the antenna at the spacecraft) into the APP; Terry had set up the receivers and calculated the System Temperature before Tony contacted Track, the world wide operations centre at JPL at Pasedena in California, and passed on our system configuration and performance figures. They checked us out before I sent the antenna off to the horizon to meet Voyager, being tracked by Goldstone, in California. Exactly at the scheduled time the signal from the spacecraft filled our receivers and telemetry channels and we checked all the readings and data were as they should be. They always were - those spacecraft were as regular as the stars themselves. With Apollo we knew what was happening because we had real-time television, and the events on the moon were only happening a second or so away. Here we had no real time pictures, the images from the cameras were a string of codes passing by. Also, all the pictures we received had happened two hours ago. So, sitting at the console, all I could use was a diagram from the NOP to try and visualise what was happening to our little spacecraft so far from home. In the end Voyager 1 shot past the moon Titan closer than New York is to London. My signal cut out at exactly the moment predicted, the white In Lock light going out and the two tone alarm started singing. We waited for it to reappear. I was trying to imagine the little spacecraft speeding past the giant planet and scraping past the rings, but really it was all pure imagination because we had yet to see any close-up pictures of the rings. They came out in magazines later. Then at the calculated time I went through the acquisition procedure, tuning steadily until we reached Track Syn Frequency and there it was, as though nothing had happened. All the excitement was stored in the spacecrafts recorders, and it was our job to collect it and pass it on to the scientists at JPL. Voyager sent back 15,000 images from Saturn. If we had been using the television system used in Mariner 4 to Mars in 1965 it would have taken a whole year to send one picture!! Using radio emissions from the planet, Voyager found that Saturn spins once every 10 hours 39 minutes and 15 seconds, more than twice as fast as the Earth. The winds hurtling around Saturns equator are three times as fast as Jupiters, and ten times faster than a hurricane on Earth. Voyager measured them at 1,720 kph. You wouldnt want to land on Saturns equator carrying bits of paper!! Saturns density is less than that of water, so if there were an ocean big enough, we would be awed by the sight of the whole planet floating in the sea of water. The Voyager cameras were finding quite unexpected phenomena in this ring system Two small moons playing tag; two moons of ice speeding around Saturn seemed to be shepherding trillions of particles to hold the whole ring system together. They appeared be herding escaping particles back into the system. By the time Voyager 2 had arrived at Uranus Honeysuckle Creek had closed and I had left the space tracking industry. Tom Reid, the Station Director of Tidbinbilla, called me back to design and implement a special building at my Canberra Space Centre to show the public what was happening at the Uranus and Neptune encounters. By using the gravity of Jupiter and Saturn to increase its speed, it only took Voyager 2 twelve years to get to Neptune, instead of 20 years. Uranus is twice as far from the Sun as Saturn. Jupiter images could be relayed back to Earth at 115,200 bits per second, Saturn at 44,800 bits per second - but Uranus...? To cope with the weak signals from Uranus JPL employed a clever system that arrayed the dishes at the three big stations, one of which was Tidbinbilla. It was arrayed to the Parkes radio telescope. This gave a data rate of 21,000 bits per second. Voyager passed Uranus with what we called closest approach on 24 January 1986 at a distance of 107,984 km (67,100 miles) at 1900Z. It passed the moon Miranda at a distance of 21,613 km (13,430 miles). If it had been Voyager 1 instead of 2 at Uranus this brilliant engineering feat could not have been done, because the back-up computer of Voyager 1 had failed early in its voyage! Voyager 2 passed Neptune on 25 August, 1989 with a closest approach distance of 358,069 km (222,500 miles), and came within 7,000 km (4,350 miles) of the moon Triton. By this time 11,000 person years had been devoted to the project. It had travelled 7.1 billion kilometres from Earth and, ignoring the launch vehicle, had a staggering fuel economy of 13,000 km per litre (our Honda Accord is 10 km per litre!) Between planets its speed was 81,900 kph (50,892 mph) relative to earth, or 80,970 kph (50,314 mph) relative to the Sun, (the heliocentric velocity). While Voyager 2 was busy shooting past Neptune, Voyager 1, by now high above the ecliptic, was able to look back at a view of the whole solar system - a view never seen by Earthlings before. From its elevated vantage point, the Voyager scientists programmed it to take telephoto pictures of all the planets, except Pluto. The Voyager scientists liken sending a signal to the Voyager spacecraft to throwing a cricket ball across the Pacific Ocean to enter a selected porthole of a moving cruise liner. In July 2003 these four spacecraft were pushing their way out into our Milky Way Galaxy, beyond the orbit of the planet Pluto. Voyager 1 is the farthest from Earth, travelling at a speed of 62,763 km per hour (139,000 mph) relative to the Sun, and leaving us at 3.5 AUs per year. It is over 13.122 billion kilometres from the Earth, and the signals from the Earth-based tracking stations take 24 hours 39 minutes to get to the spacecraft and back at the speed of light. Voyager 2 is 10.474 billion kilometres away from us, travelling at 3.1 AUs per year and it takes 19 hours 24 minutes for the signal to get there and back. Sometime in the first few years of the 21st Century the Voyagers are expected to cross the heliopause, the outermost edge of the suns solar wind, possibly 50,000 AUs away. Scientists estimate the Suns gravitational field may go out to 2 light years. Once past the heliopause, the Voyagers will be free of the Suns particles and enter interstellar space. If it is before 2020 we will probably detect it, if after we will miss it. Voyager scientists predict that it is possible we may first lose the signals from the spacecraft in 2006 when the Suns light will become so feeble the Sun sensor will not be able to lock on to it, and the spacecraft will begin to tumble, sweeping its transmitted signal all over the cosmos. No tracking station would be able to find the signal. If the sun sensor can manage to keep locked on the Sun, the knock out failure is expected to be the thermal power generators will cool down for lack of Plutonium fuel in 2020 and drop below the minimum working power of 230 watts; the spacecraft electronics would freeze, and the transmitted signal will disappear. Thats when the spacecraft would really shut down. Finally around 2023 the Hydrazine attitude propellant to keep the spacecrafts antenna pointing at Earth will run out, and the spacecraft will tumble out of control in drift mode for the rest of time. As I write this we say farewell to our four little spacecraft as they approach the heliopause and leave the solar system to enter the vast, unimaginable distances of the intragalactic void, travelling on excruciating lonely journeys  four specks from Earth. As they dont have the velocity to escape the galaxy, all four will wander around the vast, empty spiral arms of the Milky Way, leaving our sun and its planets to become just another dim star in the heavens. I wonder if they are the only spacecraft travelling in our galaxy  or any galaxy? Pioneer 10 is going back along the tail of the solar systems heliosphere heading for Taurus which it should reach in 2 million years, while Pioneer 11 is going out ahead of us towards the Constellation of Aquila which it should reach in 4 million years. Voyager 1 is climbing above the ecliptic at an angle of 35° and a speed of 60,000 kph relative to the Earth heading for the Constellation Ophiuchus which it should reach in the year 40,272 AD, while Voyager 2 is plummeting down at an angle of 47°, travelling at a speed of 58,000 kph from Earth, heading for Sagitarrius and Pavo. In about 40,000 years it will pass within 1.7 light years of the small star of Ross248 in the Constellation of Andromeda. I notice that in 2003 NASA expects the spacecraft will survive until 2020. We shall see. If there is some way to keep all the spacecraft systems going, the signal from Voyager 2s 10 watt transmitter would be expected to fade out completely around 2160. At that point Voyager will be 92,774,940,000 kilometres from Earth. To grasp the size of that number, it would take you 131,440 years to travel to it at 80 kilometres per hour in a car!! On Earth we will still be on our first trip around the galaxy, still only 2% of the first time around!! After we lose their signals, the Pioneer and Voyagers journeys will then go on forever, possibly still travelling somewhere in the galaxy when our sun has long burned itself out, and the human race has either moved elsewhere, or become extinct. The Apollo Project is over, and is now part of our history. Because it involved people, Apollo was very exciting, and I suspect the media will always make a bigger deal of it. 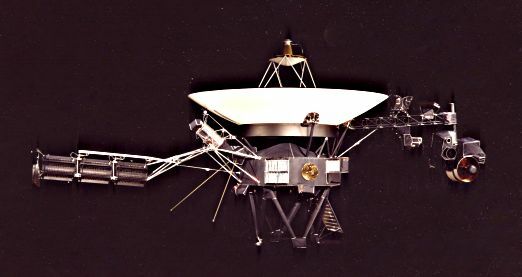 But to me JPLs Voyager Project is really much more mind bending than Apollo, because it is so much more expansive, outrageously successful, and is an ongoing project with no end - we are talking in millions of years; possibly outlasting the existence of our solar system. Even in my youth we had a pretty good idea of what the moon had in store for us from our earth-based telescopes, but, until Voyager the outer planets were mysterious worlds beyond our vision and comprehension. The discoveries of the Voyager spacecraft instantly outdated and changed all the astronomy and science books about our solar system and its planets. It takes 245 million years for our Solar System to travel around the Galaxy once. Mankind, even before the cave dwellers, has been around for two to three million years at the very most. So we have hardly begun our first orbit of the Galaxy. Even the Dinosaurs only made it a quarter of the way around. In that short space of time we have left the planet Earth - surely a remarkable achievement? Will there ever be such a gigantic leap forward in so short a time by any form of life in the evolution of the Earth? What about our Milky Way Galaxy and its Super Massive Black Hole lurking in the centre? What is going happen to it, the Voyager spacecraft and us? First named by American physicist John Wheeler in 1967, Black Holes were offered as a theory to explain where a lot of missing Universal matter was hiding, and why light bent around certain areas. By 2003 research by astronomers using the Hubble Telescope, NASAs Chandra X Ray Observatory, and VLBI arrays on Earth, have determined there are Black Holes and Super Massive Black Holes in the centre of just about every galaxy. Some galaxies, such as NGC 6240, 400 light years (1 light year is = to 5.88 trillion miles) distant, have two Super Massive Black Holes circling each other, 3000 light years apart. They will eventually collide in a cataclysmic event to create a Super Massive Black Hole twice as big as the original two, and generating the most powerful gravitational waves in the Universe. Although we can speak about them, our limited brains cannot really visualise such cataclysmic events. There are two kinds of Super Massive Black Holes, the Feeding and the Quiet. We basically have a quiet SMBH at the core of our Galaxy, but it has been observed to be having snacks of stray gases, but astronomers believe it is not going to develop into a feeding Black Hole again just yet. Our SMBH has been measured as 2 million times the mass of the Sun crammed into a space 150 million kilometres wide 2,800 light years away from our Solar System. Our nearest neighbour, the Andromeda Galaxy 2.3 million light years away, is much bigger, with a SMBH 30 million times the mass of the Sun. We have talked a lot about the Universe, which most of my life was the whole of our environment, but now we are talking about the Multiverse, where there are many universes, with a whole lot of wild theories about their interactions. One theory is that a collision of two of these Multiverses created the Big Bang, which has resulted in us being here. Cosmologists are closing in on the events after the Big Bang, and have now discovered the oldest star yet seen. After sifting through over 1 million candidate stars, it was spotted by a team led by German Norbert Christlieb from Hamburg Observatory in October 2002, using images from the 1-metre Schmidt Telescope in Chile. They called it HE 0107-5240. As this star is supposed to be 13.5 billion years old they think it formed before the galaxies and most of the elements around us. This is the closest we have ever come to the conditions directly after the Big Bang, It will enable astronomers to perform stellar archaeology, said Christlieb. Cosmologists are hoping it is going to reveal what happened in the 200 million years just after the Big Bang 13.7 billion years ago. This discovery has likened it to finding a 5000 year old Egyptian pharaoh living today, able to remember the Neanderthals 30,000 years earlier. In the period just after the Big Bang Cosmologists think the Universe consisted mostly of hydrogen (73%) and helium (25%), with a smidgin of lithium and beryllium (2%). The very first stars to congeal from this primordial gas would have looked nothing like the stars we see today. Weighing hundreds of times more than our sun, these monsters burnt their fuel at breakneck speed, which made them 10 million times brighter than todays stars, but they had no heavy elements, or metals, at all. These heavier elements would come from the nuclear reactions in their cores. When these early stars exploded these elements would spew out into space providing the raw materials for the first generation of stars, known as Population III stars, such as HE 0107-5240. When these stars matured into Supergiants they blew off heavier elements in strong stellar winds to generate Population II stars, which now contained elements of carbon, oxygen, silicon, sulphur, neon, magnesium, and iron. Later generations of stars formed over billions of years from the contaminated gas and dust into Population I stars, which contain all the elements we know of today, of which our Sun is a later member. Early days on this one, to be handed on to future generations to work on. So my tale ends with our minds blown out by the future and its possibilities and the awesomeness of our solar system and the galaxies and super massive black holes of the Universe, as well as marvelling at the ability of the human race to be so successful at exploring the solar system and galactic environment at our first attempt. I am proud to have been a member of the teams that put humans on the moon, and sent the first robot spacecraft out into our galaxy on a trip that will last forever, the first man-made objects to leave the solar system, the first to carry the message of our existence out into the Milky Way Galaxy. They will become lost in the spiral arms of the galaxy, split from our Earthly history and completely isolated from the events lying in our future and the future of the solar system. Their voyages will continue long after the human race has become extinct; they will probably still be drifting along unknown reaches of the galaxy when our sun eventually burns out and becomes a cold, lifeless White Dwarf star. What a contrast to my ancestors in Scotland who rode about on horseback, fighting battles with swords and bows and arrows, and the only means of communication was sending a running gillie or a horseman off to deliver a message! Are our spacecraft the vanguard of other spacecraft to follow? Will manned spacecraft ever follow them, seeking other worlds? Will we ever leave our solar system...? Is there a form of life out there to discover the two Pioneers and the two Voyagers, and thus become aware of our Earth and its existence? Perhaps a form of life will evolve and discover our spacecraft in the future. Some are frightened that a belligerent form of life will find one of our spacecraft, follow the directions on them to Earth and come to attack us. If they do, and it could be thousands, perhaps millions of years in the future, the two Voyager spacecraft are carrying messages and sounds of the Planet Earth around the Galaxy on a gold disc Carl Sagan called Murmurs of Earth  from our time in the second half of the twentieth century. 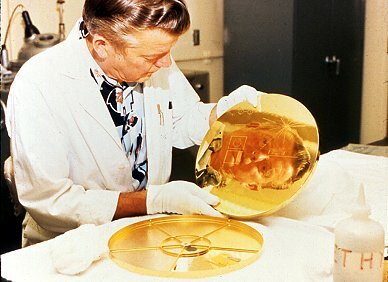 The gold disk with the sounds and music of Earth on the Voyager spacecraft. These sounds of our times will be carried forever, or for as long as the Milky Way Galaxy exists.